I never imagined the transference of artistic responsibilities of Jamie McKelvie to a separate individual per issue would prove so esoteric. Two issues in and the work Kate Brown showed on issue 12 was phenomenal and Tula Lotay proves just as brilliant in the latest one. 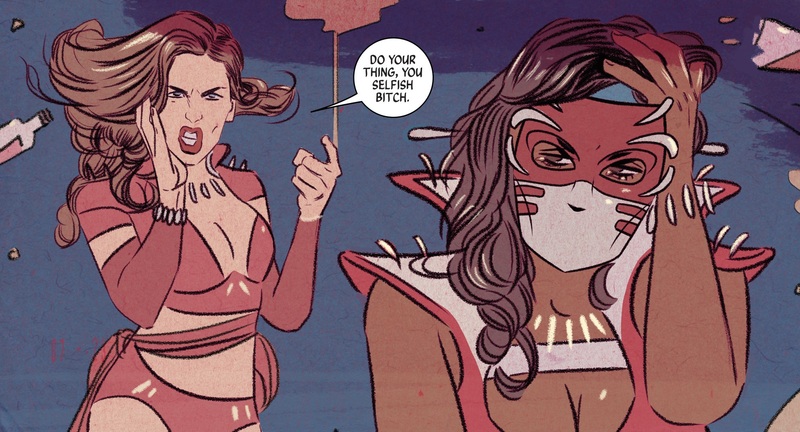 I think by now we have accepted death in WicDiv. From the early loss of Luci, the cruel ending of Innana and the sad demise of Laura, nothing is sacred and the story presides above all else. But we all knew this because the very first pages of this comic saw an older set of deities end their lives. So where does the Pantheon and Gillen and McKelvie go to next? Well a this issue sees an unfamiliar kind of death, of a God we have yet to meet; Tara. Tara’s evolution into a God was not necessarily a transition into something that would bring her joy or opportunity, instead it seemed more like a cruel twist of fate. Her origins as a beautiful young woman are tainted by an insidious undercurrent of lustfulness and jealousy. Gillen coyly focuses upon the negative aspects of being the pretty girl in school, instead of Tara lavishing the attention of all the boys and girls, she hides away from it. Her level of insight and self-awareness is remarkable for someone so young but despite her best intentions, her physical attributes carry her through education. It is these very moments that Lotay is able to readily deliver the resigned misery of her visage. Tula draws beautiful characters with such naturalness and originality. Her women genuinely look distinct and you only need to look at Ananke to see how aesthetic a wrinkly older lady can look. On top of this she envisages depression and woefulness. Given this is probably the only issue we are likely to see Tara, it serves as a biography. Her younger days are plagued by her determination to earn merit for her actual artistic ability, with Lotay showing her in quite grim locale. Tula colours her own work providing a distinct feel to the backdrops of her panels. She provides a blurring of colours at times and a fading of detail, often intimately relating to the emotions on the page. The characters are often central and work best in closer shots. The personal tragedy is a trope quite suited to Tula’s skills as shown by the hideous crowd responses at Tara’s concert and the final pages of anguish. As the Goddess reads through the tweets directed towards her, we are similarly disgusted at the vitriol of the Internet cabal. At the same time, we secretly hope that Kieron Gillen’s imagination was not solely responsible for some of the despicable sentences written. However they achieve the desired effect with extra zeal, as they nauseate the reader to a massive degree but sadly still less than they do Tara. 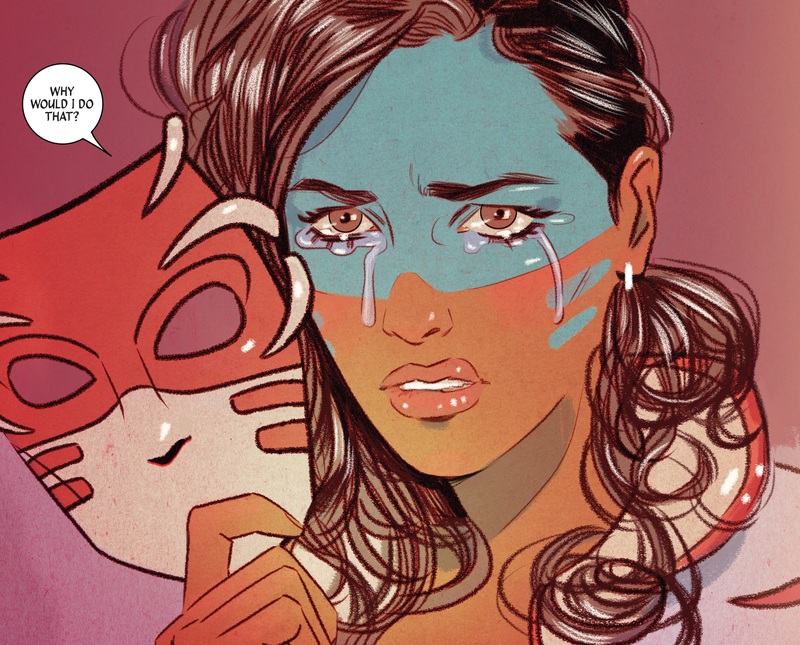 This issue depicts a very interesting aspect of the mythology of #WicDiv and Tara is one of the first Gods that does not have a clear cultural reference. She even says it herself in the issue that she had no real idea which Tara she is supposed to be. But what seems more obvious is that she is divergent from the others and is essentially in opposition to their glorification. Tara veered away from publicity and wears a mask for as long as she can manage, not because she wants anonymity but because she wants people to listen to her, not just look at her face. There are scenes demonstrating misconceptions of her as arrogant, featuring reporters, fans and even her fellow God Baal. It is not a far cry from the classic stereotype of the conceited superstar but in fact, there may not be any real famous people who steer away from the attention their appearance brings. Gillen and Lotay provide an insight into a persona rarely seen, one that they successfully allow us to empathise with. Especially as Tara decides to end her two-year life span early. 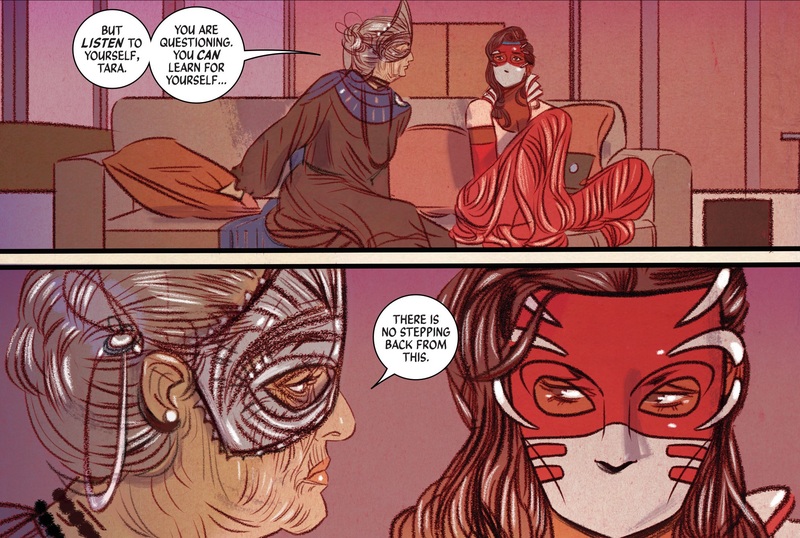 Ananke’s motivation for making Tara into a God seems a particularly nasty one, as instantly she was forced into a limelight she desperately didn’t want. As she came to accept her new role, there is an impression that it was never for her benefit, despite it being chance to showcase her talent. This may be the reason why Ananke states she has much in common with Urdr. The fandom dictates that you serve your purpose as superficial idolatry without straying from that remit. There are many singers who ventured into other forms of sound or even art that were met with great disgust at the change, Dylan instantly springs to mind. The creators provide a particularly nuanced perspective into the world of hero worship and conforming to type. Time will only tell whether Ananke had a grander plan for Tara or whether her death was simply to provide rest for a life lived in resignation. In any case this issue shows a desperately sad side to the Pantheon of Gods and reveres the broken heart of Tara. Previous PostThe Theatre List 5/8 – Where for art thou DC?